This Laurent Giles 60′ Sailing Ketch was built in 1984 by Picchiotti in Italy, and designed by Laurent Giles. She has an aluminium hull and superstructure, with armour glass windows in stainless steel framing, S-shaped semi long keel white hull with blue trim striping, and new stainless steel dorades. Her owners purchased her at the beginning of 2018, and are selling as she is a little too large and does not quite suit their requirements. 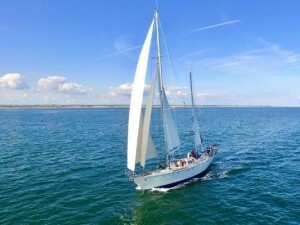 She has been well looked after and is ready to set sail with her new owners. As with any older boat with some TLC is to be expected but she is ready to go to sea tomorrow and an opportunity to acquire a stunning classic at a great price. Her hull was surveyed with ultrasonic meter in January and found to be in ?very good? condition with no deterioration of the aluminium. Aluminium boats are incredibly strong and light and, as long as care is taken with dissimilar metals, do not corrode. Her anodes are in good condition and she has an isolation transformer to prevent damage from stray shore power currents as well as a galvanic isolator.